The Rollgliss R550 offers the choice of controlled descent rescue, evacuation or the versatility of assisted rescue with lifting capabilities. This state-of-the-art, fully automatic controlled descent device can be used for rescue and evacuation from heights up to 1,640 ft. (500m) for one user 310 lbs. (141kg) or 575 ft. (175m) for two users totaling 620 lbs. (282kg). It features 3/8 in. 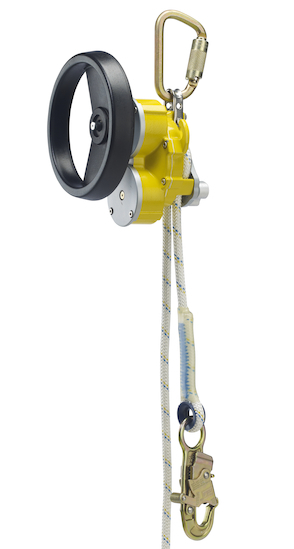 (9.5mm) super static kernmantle rope, and is configured with connecting hardware at each end of the lifeline to operate in both directions. During assisted-rescue scenarios, a fallen worker can be attached to the R550 device, raised to a point that allows their fall arrest device to be removed, then lowered to the ground safely. Remember, during an emergency every second counts! You can count-on and trust the DBI-SALA Rollgliss systems, in use all over the world; Wind Turbine Construction & Maintenance, Utility Pole/Tower Construction & Maintenance, Fire & Emergency Rescue Services, Commercial Construction Sites, Industry and MRO Facilities, Government & Military Operations and more! Emergency rescue and evacuation from a wide variety of elevated work areas - Offers a fast and reliable rescue solution that requires minimal training for added safety. Fully automatic controlled descent - Enables fast, safe and effective descent at 2-3 ft. (0.6-0.9 m) per second with no manipulation required by the user for complete ease of use. Bidirectional design enables multiple rescues - For added versatility, as one end of the lifeline descends, the other ascends ready for another rescue. 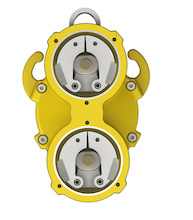 Built-in rescue lifting wheel - Used during assisted rescue to slightly raise the fallen worker to disengage their fall protection system so descender can lower victim to the ground. 350 ft. (107 m) 3/8" (9.5 mm) kernmantle rope lifeline - The super static kernmantle rope is lightweight, yet extremely strong and durable and incorporates a snap hook at each end for multiple rescues. Rated for up to 1,640 ft. (500 m) height for one user, 575 ft. (175 m) for two users - Unique design accomodates one user at 310 lbs. (140 kg) or two users totaling 620 lbs. (282 kg) for added jobsite flexibility. Compact and lightweight design - Provides fast installation and easy operation enabling efficient and effective rescue. High strength corrosion resistant construction - Aluminum and stainless steel construction will stand up to the elements for an extended service life. Integrated rope ears - Allows for greater descent speed control in assisted rescues for added safety. Dual brake design - Automatic descent with added security, safety and peace of mind. Equipped with i-Safe - Integrated RFID identification tag for recording and storing information on inspections and tracking safety equipment. Kit also contains 4 ft. (1.2m) anchor sling, two carabiners and carrying bag - We've included several accessories offering expanded operation, safety and versatility, many other items are available such as ladder bracket to customize the system to your specific needs. Other standard and custom lengths are available - Customize to suit your specific jobsite or lengthen to fit greatest height needed, last three digits in part number detail length in feet. 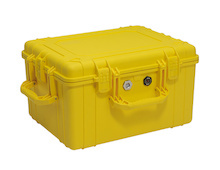 Models also available without lifting wheel or add a humidity case. - Various configurations and options are available to suit most site requirements for added peace of mind. Standards OSHA 1910.66, OSHA 1926.502, ANSI Z359.4, Capital Safety Gen. Mfg. Req.